Allen Bernard West (born February 7, 1961) is an American political commentator, retired U.S. Army lieutenant colonel, and former member of the U.S. House of Representatives. A member of the Republican Party, West represented Florida's 22nd congressional district in the House from 2011 to 2013. West was born in Georgia and joined the Army in 1983. He was deployed to Kuwait in 1991 and Iraq in 2003. In 2003, West was charged in an incident that involved the beating and simulated execution of an Iraqi policeman. After an Article 32 hearing was held, West accepted non-judicial punishment, was fined $5,000, and allowed to retire as a lieutenant colonel. After leaving the military, he and his family moved to Florida, where he taught at a high school for a year and worked for a defense contractor, part of this time spent in Afghanistan as a civilian adviser to the Afghan National Army. West entered politics in 2008 as the Republican nominee for Florida's 22nd congressional district in 2008, losing to Democratic incumbent Ron Klein. In a re-match in 2010, he won the seat, coinciding with significant Republican gains in the 2010 midterm elections. West took office in January 2011 as the first African-American Republican Congressman from Florida since Josiah T. Walls left office in 1876 near the end of Reconstruction. In Congress, West served on the Armed Services and Small Business Committees and was a high-profile member of the Tea Party Caucus and the Tea Party movement. Redistricting due to the 2010 census resulted in West switching to Florida's 18th congressional district for the 2012 House elections. He lost by 2,146 votes to Democratic nominee Patrick Murphy in what would turn out to be the most expensive congressional race in U.S. history to date. After a recount extended Murphy's lead, the original results were certified and West conceded to Murphy on November 20, 2012. He is a contributor for Fox News and his first book, Guardian of the Republic, was published in April 2014. Allen Bernard West was born in Atlanta, Georgia, to Elizabeth (née Thomas; 1931–1994) and Herman West, Sr. (1920–1986) on February 7, 1961. His father and older brother were both career military officers; West's father served in World War II, and his brother served in Vietnam. His mother was a civilian employee of the United States Marine Corps. Although both of his parents were registered Democrats, West has remarked that they raised him "very conservatively". In the tenth grade, West joined the Junior Reserve Officers' Training Corps program and entered the Army in 1983 when he graduated from the University of Tennessee. West is the third of four consecutive generations in his family to serve in the U.S. Armed Forces. He later received a master's degree in political science from Kansas State University. He also earned a master of military arts and sciences degree from the U.S. Army Command and General Staff Officer College in political theory and military history and operations. West entered active duty on November 1, 1983, at Fort Sill, Oklahoma, where he completed the Field Artillery Officer's Basic Course (FACBOC). He then proceeded to airborne training at Fort Benning, Georgia, where he received his Parachutist Badge. His first assignment was as an airborne infantry fire support officer and platoon leader, as well as battalion training officer for the 4th B.C.T. (Battalion Combat Team), 325th Airborne Infantry Regiment, SETAF (Southern European Task Force) under the command of Lt. Col. Thomas R. Needham at Caserma Ederle in Vicenza, Italy. In 1987, West was promoted to captain and attended the Field Artillery Officer's Advanced Course. Following graduation, West took command of B Battery, 6th Field Artillery Regiment, 1st Infantry Division. He served as the battalion task force fire support officer for 2d Battalion, 16th Infantry Regiment. As a member of the 1st Infantry Division he deployed for Operation Desert Shield and Operation Desert Storm. After returning from Kuwait, West served as an Army ROTC instructor at Kansas State University from 1991 to 1994, becoming the U.S. Army ROTC Instructor of the Year in 1993. In January 1995 he was assigned to the 2nd Infantry Division Support Command as the assistant operations/combat plans officer. West was promoted to major before he attended the U.S. Army Command and General Staff College in 1997. Upon completion, he became the operations officer for the 18th Field Artillery Brigade before being assigned as executive officer of 1st Battalion, 377th Field Artillery Regiment. Afterwards, West served as an Army exchange officer at the II Marine Expeditionary Force at Camp Lejeune from 1999 to 2002 and was promoted to lieutenant colonel. The culminating assignment of West's career was his assumption of command of the 2d Battalion, 20th Field Artillery Regiment, 4th Infantry Division on June 6, 2002. During the Iraq War in 2003, he deployed with his battalion until he was relieved of command by the Army following a use-of-force incident concerning an Iraqi policeman. At his Article 32 hearing, West admitted violating Army rules by holding the policeman captive, punching him in the face, conducting a mock execution and by firing a pistol held against the Iraqi's head. West was subsequently allowed to retire in 2004. West's awards and decorations include the Bronze Star; Meritorious Service Medal (two Oak Leaf Clusters); Army Commendation Medal (three Oak Leaf Clusters, one Valor Device); Army Achievement Medal (one Oak Leaf Cluster); Valorous Unit Award; Air Assault Badge; and the Master Parachutist Badge. While serving in Taji, Iraq, West received information from an intelligence specialist about a plot to ambush his unit. The alleged plot involved Yahya Jhodri Hamoodi, an Iraqi police officer. West had his men detain Hamoodi. Soldiers testified that in the process of detaining Hamoodi, he appeared to reach for his weapon and needed to be subdued. Hamoodi was beaten by four soldiers from the 2/20th Field Artillery Battalion on the head and body. West then fired his pistol near Hamoodi's head, after which Hamoodi provided West with names and information, which Hamoodi later described as "meaningless information induced by fear and pain". At least one of these suspects was arrested as a result, but no plans for attacks or weapons were found. West said "At the time I had to base my decision on the intelligence I received. It's possible that I was wrong about Mr. Hamoodi." West was charged with violating Articles 128 (assault) and 134 (general article) of the Uniform Code of Military Justice. During a hearing held as part of an Article 32 investigation in November 2003, West stated, "I know the method I used was not right, but I wanted to take care of my soldiers." The charges were ultimately referred to an Article 15 proceeding rather than court-martial, at which West was fined $5,000. West accepted the judgment and retired with full benefits as a lieutenant colonel in the summer of 2004. Asked if he would act differently under similar circumstances, West testified, "If it's about the lives of my soldiers at stake, I'd go through hell with a gasoline can." At his hearing, West said that there were no ambushes against American forces in Taji until he was relieved of his leadership post a month later. After West's retirement he received more than 2,000 letters and e-mails offering him moral support. A letter supporting West was signed by 95 members of the U.S. Congress and sent to the Secretary of the Army. After retiring from the Army, West and his family moved to Florida. He taught U.S. history and coached track and field at Deerfield Beach High School for a year. He then spent two years working for Military Professional Resources Inc. (MPRI), a defense contractor. While with MPRI, West was positioned in Kandahar, Afghanistan. In that capacity, he was an adviser to the Afghan National Army. In 2006, 25-year incumbent Republican E. Clay Shaw, Jr. was defeated by Democrat Ron Klein in Florida's 22nd Congressional District. Allen West entered politics in 2008 to regain the lost House seat, challenging freshman incumbent Klein. West received the Republican nomination without opposition. However, he lost to Klein by a margin of 9.4% of the votes. The official results were Klein with 169,041 votes (54.7%), West with 140,104 votes (45.3%), and write-in candidate Michael Prysner with 6 votes. West spoke at the Conservative Political Action Conference on February 20, 2010, and was endorsed by former Alaska Governor Sarah Palin. West was one of 32 African-American Republican candidates for Congress in 2010. He said he supported the Tea Party movement and rejected the notion that the movement was motivated by racism, saying the accusation was a creation of liberal critics and the news media. West has been described as a "tea party star" became a member of the congressional Tea Party Caucus in February 2011. In September 2010, the Florida Democratic Party produced a flyer that contained West's unredacted Social Security number. While the party called it an "oversight" and offered to pay for identity theft protection, West harshly condemned the flyer for exposing his family to identity theft. West defeated incumbent Ron Klein by a margin of 8.8%. West, along with newly elected Tim Scott, were the first African-American Republicans in Congress since J.C. Watts retired in 2003. West raised $5.4 million for his campaign, while his incumbent opponent raised $2.5 million. According to West, "...over 97 percent of our donations have come from individual contributions." West speaking at the 2013 Conservative Political Action Conference (CPAC) in Washington, D.C.
West raised more than $1.5 million in the 2011 second quarter to support his 2012 reelection bid. The National Journal's Cook Political Report in 2011 named West one of the top 10 Republicans most vulnerable to redistricting in 2012. Redistricting made the 22nd, which already had a modest Democratic lean, even more Democratic. West faced the prospect of running against West Palm Beach mayor Lois Frankel in the general election. On February 1, 2012, West announced that he would run for reelection in the neighboring 18th District. That district had previously been the 16th, represented by fellow Republican Tom Rooney. However, Rooney opted to seek reelection in the newly created 17th District, a move that was considered likely to dramatically improve West's chances of reelection, although it was still a competitive race. In the new district, West received a primary challenge from Martin County Sheriff Robert Crowder. West did not debate Crowder and said "debating an uninformed opponent would waste voters' time". Incumbent West defeated Crowder in a landslide, receiving 74.4% of the vote. His general election opponent was Democrat Patrick Murphy, a political newcomer and a Republican until 2011. The campaign featured several negative ads, including one released by American Sunrise PAC that was extremely critical of West's policies and depicted him in violent cartoon action against several individuals. West issued a statement condemning the ad, stating that it "plays on stereotypes" with the goal of diverting Americans from more pressing matters at hand such as high unemployment. He claimed the ad was released by the family of his opponent. The campaign manager of his opponent, said the ad was from a third party and therefore held no liability for it. After primary opponent Crowder endorsed Murphy, a spokesman of the West campaign said "Crowder is a Democrat and a sore loser. I'm shocked he waited this long. Perhaps Crowder hopes to continue cozying up to local Democrats so he can be their nominee against Allen West in 2014." Initial vote counts showed Murphy defeating West by a narrow margin of 2,000 votes. West did not concede, citing irregularities in St. Lucie County where some early ballots may have been counted twice. Florida state election officials unofficially certified Murphy as the winner, A partial recount of early ballots cast between November 1 and 3, 2012, in St. Lucie County slightly decreased the margin separating the candidates, and the West campaign sought further recounts. West said that if the final results show a loss, he would not cling to his title as a member of Congress, but wanted to ensure a fair election was carried out, raising the potential of a protracted legal battle. As of the November 18 state deadline, the St. Lucie County election officials had not completed a recount of all of the early ballots, and so the previously submitted vote count which showed Murphy as the winner by 2,146 votes was submitted to the state election officials. The West campaign conceded the election on November 20, 2012. Meanwhile, Frankel went on to victory in the 22nd. There are those who will hate your own country, America, regardless of the self-evident truths. To you I say that life just does not get any better than the 'Land of the all night IHOP' … and if you truly hate America so much, you are also free to find another home. There is surely an illegal immigrant who will be happy in yours. West's rhetoric won him both support and condemnation from differing groups along the American political spectrum. Members of the conservative movement viewed him as a "torch bearer" and "conservative icon", with Sarah Palin and Ted Nugent both suggesting him for vice president, and Glenn Beck supporting him for president. In January 2013, U.S. Representatives Paul Broun (R-Georgia) and Louie Gohmert (R-Texas) both voted for West as Speaker of the House, even though he was no longer a member of Congress. Some of his statements include calling President Barack Obama "an abject failure", ordering both pro-Palestinian demonstrators and the views of "chicken men" Democrats to "get the hell out" of the United States, opining that drivers with Obama bumper stickers are "a threat to the gene pool", and pronouncing that African American Democrats are trying to keep African Americans "on the plantation", while casting himself as the "modern-day Harriet Tubman" ferrying them to rescue. In a critical summation of West's style, the liberal magazine Mother Jones opined that "[for West] every sentence is a proxy war in the larger struggle between patriots and the 'people in this world that just have to have their butts kicked.'". In January 2011, West joined House Foreign Affairs Committee chairwoman Ileana Ros-Lehtinen (R-FL) in condemning the official flying of a Palestine Liberation Organization flag in Washington D.C. West said that the raising of the flag is "an attempt to legitimize an organization with a known history of terrorist actions". In February, West described Michael Ledeen as one of his "foreign policy heroes", and implored his followers to read Saul Alinsky's Rules for Radicals to "understand what they're up against". Other authors West has cited in helping him shape his worldview include philosopher John Stuart Mill and Union Army General William Tecumseh Sherman. On June 2, 2011 Allen West wrote a letter to President Obama urging him to grant clemency to Jonathan Pollard. Mr. West wrote, "After serving 26 years behind bars, Jonathan Pollard's health is deteriorating, as is his wife's. If we can consent to the release by the British of the Lockerbie bomber back to Libya due to health concern, how can we justify keeping Mr. Pollard behind bars when his crimes were clearly not as serious as a terrorist who murdered hundreds of Americans?" Pollard was released on November 20, 2015, in accordance with federal guidelines in place at the time of his sentencing. Anne Pollard, his ex-wife, said "No one helped him. No government reduced his sentence by even one day." West attempted to cast his work overseas in historical terms, theorizing that America is following in the footsteps of Charles Martel at the Battle of Tours, or the 300 Spartan Hoplites at the Battle of Thermopylae, in defending Western civilization against Muslim threats from the Middle East. In speaking on what he believed to be Islam's proclivity for violence, West remarked that "Something happened when Mohammed enacted the Hijra and he left Mecca and he went out to Medina, it became violence." Because of this view, in February 2011, West cited the threat of "radical Islamic terrorists" as his motivation for voting to extend provisions of the Patriot Act; He voted against another extension in May 2011. When asked during an interview with The Shalom Show how he would work with others "like Keith Ellison, who supports Islam", West stated that Ellison, a Minnesota representative and practicing Muslim, represents the "antithesis of the principles upon which this country was established". West later argued that his initial comment was misconstrued. He said the comments were "not about his Islamic faith, but about his continued support of the Council on American-Islamic Relations (CAIR)". In a Boynton Beach Town Hall meeting, West told the Miami leader of CAIR that "I will always defend your right to practice a free religion under the First Amendment, but what you must understand, if I am speaking the truth, I am not going to stop speaking the truth. The truth is not subjective." On July 19, 2011, West sent an email to Democratic representative and Democratic National Committee chairwoman Debbie Wasserman Schultz in response to comments directed at him in a speech the congresswoman made on the floor of the House of Representatives after West had departed the chamber. West's email, which he copied to members of House Democratic and Republican leadership, characterized Wasserman as "the most vile, unprofessional, and despicable member of the US House of Representatives", said that she was "not a lady" and asked that she focus, instead, on her own congressional district. This is a long-standing dispute that West says "dates back to the disgusting protest you ordered at my campaign headquarters, October 2010 in Deerfield Beach". At a town hall meeting in Palm City, Florida on April 11, 2012, West was asked by a man in the audience, "What percentage of the American legislature do you think are card carrying Marxists or International Socialists?" West responded that "there's about 78 to 81 members of the Democrat Party that are members of the Communist Party." When asked to name them, he replied "It's called the Congressional Progressive Caucus." West was appointed to the House Armed Services Committee and the Small Business Committee. When West joined the Congressional Black Caucus (CBC) on January 5, 2011, he became the first Republican to join the CBC since former Congressman Gary Franks of Connecticut retired in 1997. On May 16, 2013, Fox News announced it had hired West as a contributor to offer political commentary during the network's daytime and prime time shows. Following the Charleston church shooting in 2015, South Carolina Governor Nikki Haley called for the Confederate Battle flag to be removed from a memorial outside the state capital. West referred to the debate over the flag as a "manufactured crisis" invented by liberals to distract from black-on-black violence. On December 9, 2016, West's official Facebook page posted that Trump had selected James Mattis as Secretary of Defense to exterminate Muslims. Michele Hickford, the editor-in-chief of West's website, removed the post, apologized to readers, claimed she did not post it, took responsibility as editor-in-chief, and stated West had no part in the post. In 2014 column, West described himself as a classical liberal. West is a Life and Endowment Member of the National Rifle Association (NRA). In May 2016, he announced that he had been elected as a member of the NRA Board of Directors for a three-year term. West was an Executive Director and Vice Chairman of the Board of Directors of the National Center for Policy Analysis, a free-market public policy research organization. In September 2015, West was nominated to the Sunset Advisory Commission, which oversees the need for Texas state agencies, as the Texas Senate's appointed public member. West was first married to Gayle Mosby. Later, West married Angela M. Graham on December 24, 1989. She holds a Ph.D. in education from Kansas State University, and received a gubernatorial appointment to the board of trustees of Florida Atlantic University. They have two daughters. West and his family moved to Texas after he became CEO of the Dallas-based National Center for Policy Analysis in January 2015. He is a Christian. He is a certified master scuba diver, motorcycle enthusiast and honorary member of the Blue Knights International Law Enforcement Motorcycle Club. He was a co-host for Troopathon 2013. ^ a b "WEST, Allen - Biographical Information". bioguide.congress.gov. Retrieved 2016-03-28. ^ "CNN.com – U.S. officer fined for harsh interrogation tactics – Dec. 13, 2003". ^ "Minority candidates rack up poll history". London Morning Star. November 3, 2010. Archived from the original on November 5, 2010. Retrieved November 3, 2010. In Florida Allen West is the first black Republican to have been elected to Congress from Florida since the 1870s. ^ a b c d e f g h Murphy, Tim. "Allen West's Rise From the Florida Fever Swamps: A Short, Strange Trip into the Belly of the Anti-Shariah Beast", Mother Jones, July/August 2012. ^ "Most Expensive Races". OpenSecrets.org. 2013-04-16. Retrieved 2015-05-05. ^ a b "Allen West concedes to Patrick Murphy". Politico. November 20, 2012. Retrieved November 20, 2012. ^ Weiner, Rachel. Allen West hired as Fox News contributor, Washington Post, May 17, 2013. ^ Kate Nocera, Rosie Gray. "Allen West Out At PJ Media". BuzzFeed. ^ "Guardian of the Republic". Randomhouse.com. ^ "Black conservatives afforded no safe quarter". Allen B. West – AllenBWest.com. ^ a b Man, Anthony (December 4, 2010). "Allen West: from controversy to Congress". South Florida Sun-Sentinel. Retrieved September 4, 2011. ^ a b "About Allen West". Allen West for Congress. September 1, 2010. Archived from the original on September 3, 2011. Retrieved September 4, 2011. ^ Speakers Who Embody American Values Retrieved March 6th, 2015. Written By Blair Hersch. ^ a b "Lieutenant Colonel Allen West profile at". American Greatness. AmericanGreatness.org. November 23, 2010. Retrieved March 1, 2011. ^ "The Struggle for Iraq: How Colonel Risked His Career By Menacing Detainee and Lost". nytimes.com. May 27, 2004. Retrieved May 21, 2013. ^ "Once a Soldier... Always a Soldier" (PDF). Legislative Agenda. Association of the United States Army. 2011. Archived from the original (PDF) on October 21, 2013. Retrieved 28 January 2013. ^ a b c d "U.S. Officer Fined for Harsh Interrogation Tactics". CNN. December 12, 2003. Archived from the original on December 11, 2007. ^ Man, Anthony (December 5, 2010). "Allen West: Fiery freshman hopes to shake up Washington". South Florida Sun-Sentinel. Retrieved August 2, 2012. ^ "Allen B West is US House Republican Candidate for Florida's 22nd District". Maggiesnotebook.com. April 3, 2010. Archived from the original on July 23, 2011. Retrieved July 19, 2011. ^ Sherman, Amy. "Allen West makes waves, earns tea-party raves". Miami Herald. Retrieved July 22, 2011. ^ "Allen West joins congressional Tea Party Caucus". Sun Sentinel. February 7, 2011. Retrieved July 22, 2011. ^ Hunt, Kasie (2010-09-20). "Fla. Dems reveal opponent's SSN". Politico. ^ NPR It's All Politics, James, Frank , Black GOP Lawmakers Face Tricky Relations With Democrats, January 4, 2011. ^ Isenstadt, Alex. "Allen West rakes in $1.6M". Politico.com. Archived from the original on October 17, 2010. Retrieved November 16, 2010. ^ "Congressional Elections: Florida District 22 Race: 2010 Cycle". OpenSecrets. Archived from the original on November 16, 2010. Retrieved November 16, 2010. ^ "Rep. Allen West scores $1.5M haul in second quarter". Allen West Nation. Retrieved July 19, 2011. ^ "Allen West rakes in $1.6M". Politico.com. Retrieved July 19, 2011. ^ "Broward Politics: Congressman Allen West reports huge fundraising quarter, takes in $1.5 million". Sun Sentinel. July 11, 2011. Retrieved July 19, 2011. ^ David Wasserman and Julia Edwards (April 15, 2011). "Top 10 Republicans Most Vulnerable to Redistricting". Cook Political Report. National Journal. Archived from the original on May 1, 2011. Retrieved April 25, 2011. ^ "CBS News Political Hot Sheet for February 1, 2012". CBS. Retrieved 2012-07-11. ^ Allen West (July 3, 2012). "Allen West commentary: Debating uninformed opponent would waste voters' time". Palm Beach Post. Retrieved January 3, 2013. ^ Jennifer Bendery (August 9, 2012). "Campaign Ad Shows Allen West Punching Women In The Face". The Huffington Post. Retrieved August 10, 2012. ^ Isenstadt, Alex, "Allen West digs in", Politico, 11/12/12. ^ Stapleton, Christine (November 18, 2012). "Murphy declares victory when St. Lucie board misses noon deadline; West considers challenge". The Palm Beach Post. Retrieved November 19, 2012. ^ "Florida Election Officials Miss Tally Deadline in House Race". The New York Times. Associated Press. November 18, 2012. Retrieved November 19, 2012. ^ Wing, Nick. Allen West Pulls Votes For Speaker Of The House, Despite No Longer Serving In Congress, The Huffington Post, January 3, 2013. ^ Wallman, Brittany (January 19, 2011). "New congressman Rep. Allen West denounces raising of PLO flag". Sun Sentinel Blogs. Retrieved January 25, 2011. ^ West, Allen (February 15, 2011). "Busy Week Culminates with Closing Speech to CPAC". Red Country. Retrieved February 16, 2011. I had the chance to spend time with constituents at the showing of the film "Iranium" and was able to see one of my foreign policy heroes, Mr. Michael Ledeen. ^ Buddy Nevins. "Allen West Calls For Israeli Spy's Release". BrowardBeat.com. Retrieved 2015-05-05. ^ Judy L. Randall (2011-09-28). "Free Pollard, spy for Israel, urges Staten Island's Rep. Grimm". SILive.com. Retrieved 2015-05-05. ^ Hoffman, Gil (June 5, 2011). "'If Lockerbie bomber was freed, why not Pollard?'". The Jerusalem Post. Retrieved 2015-05-05. ^ After 30 Years, Jonathan Pollard Released From American Prison ,Haaretz, Jonathan Ris and Reuters, November 20, 2015. Retrieved 16 April 2016. ^ Man, Anthony (February 15, 2011). "Allen West catches some flak for supporting Patriot Act provisions". Broward County Sun Sentinel. Retrieved February 16, 2011. ^ "Congressman Allen West Votes "NO" on Patriot Act Renewal". The Shark Tank. May 27, 2011. ^ Herb, Jeremy (January 24, 2011). "Rep. West: Ellison "antithesis" of country's founding principles". Minneapolis Star Tribune. Retrieved February 2, 2011. ^ Hooper, Molly (February 13, 2011). "Some in Black Caucus embrace GOP member, but others say they're 'leery'". The Hill. Archived from the original on February 14, 2011. Retrieved February 2, 2011. ^ CAmia, Catalina (February 2, 2011). "GOP Rep. Allen West draws fire for Muslim comments". USA Today. Retrieved February 2, 2011. ^ Man, Anthony (July 19, 2011). "Wassserman Schultz critical of Allen West on federal budget-cutting measure". Sun Sentinel. ^ Smith, Ben (July 19, 2011). "Allen West tirade: Wasserman-Schultz 'vile...despicable...not a Lady'". Politico. ^ "Florida Reps. Allen West, Debbie Wasserman Schultz clash". Los Angeles Times. July 20, 2011. ^ Derby, Kevin (December 20, 2010). "Florida's New Republicans in Congress Get Committee Assignments". Sunshine State News. Retrieved December 20, 2010. Incoming Republican U.S. Rep. Allen West, who defeated Democrat U.S. Rep. Ron Klein in November, is headed to the House Armed Services Committee – a natural fit for West, a retired Army officer who served in Iraq. ^ Southall, Ashley (January 5, 2011). "Republican Allen West Joins Congressional Black Caucus". New York Times. Archived from the original on January 20, 2011. Retrieved February 14, 2011. The all-Democrat Congressional Black Caucus welcomed its first Republican member in 14 years on Wednesday, with the swearing-in of Representative Allen B. West of Florida. ^ "Press release: Fox News Channel Signs Former U.S. Representative Allen West to Contributor Role". Fox News. May 16, 2013. ^ "S.C. governor calls for removing Confederate flag from Capitol grounds". USA Today. 22 June 2015. Retrieved 22 June 2015. ^ "Allen West: Confederate Flag Debate 'Manufactured Crisis' to Distract from Chicago Violence". Mediaite. 29 June 2015. ^ Chris Tognotti (December 12, 2016). "Allen West Facebook meme hails a coming genocide against Muslims". The Daily Dot. Retrieved February 3, 2019. ^ "Allen West". www.facebook.com. Retrieved 2018-06-07. ^ "I have a MAJOR announcement to share with y'all…". Lt. Colonel Alleb B West. 21 May 2016. Retrieved 21 May 2016. ^ "NCPA Staff". www.ncpa.org. Retrieved 2017-07-05. ^ "Emily Pataki | Texas Sunset Commission". www.sunset.texas.gov. Retrieved 2018-06-07. ^ "FAU – Angela Graham-West". Florida Atlantic University. 2013. Retrieved 23 February 2013. ^ West, Allen (December 28, 2010). "Allen West's Final Wrap Up For 2010". allenwest2012. Archived from the original on April 21, 2011. Retrieved February 27, 2011. ^ West, Allen (June 11, 2012). 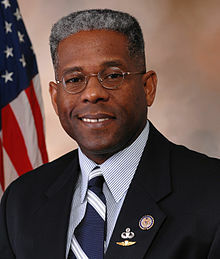 "Rep. Allen West moves to Palm Beach Gardens". TCpalm. Retrieved June 26, 2012. ^ Man, Anthony (November 10, 2014). "It's goodbye for Allen West, who's leaving Florida". Orlando Sentinel. Retrieved January 12, 2015. ^ "Allen West making final Florida appearance". Associated Press. December 20, 2014. Retrieved January 12, 2015. ^ "Allen West Joins Troopathon Effort to Support Troops with Care Packages". Move On America. Retrieved 5 June 2013. West, Allen; Hickford, Michele (2014). Guardian of the Republic: An American Ronin's Journey to Faith, Family and Freedom. Crown Forum. ISBN 978-0804138109. West, Allen (2018). Hold Texas, Hold the Nation: Victory or Death. Brown Books Publishing Group. ISBN 978-1612542980. Wikimedia Commons has media related to Allen West. This page was last edited on 19 April 2019, at 01:43 (UTC).